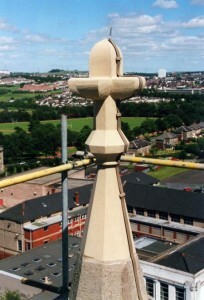 Our Historic Restoration Craftsmen are highly skilled in numerous techniques of restoring and repairing all types of stonework across Glasgow and Edinburgh’s numerous historic stonework buildings. We can guarantee that whether you request stonework repairs, stonework restoration or stonework cleaning, you will not be disappointed. With so many types of building in Glasgow and Edinburgh, our experienced team are well established to offer the very best restoration results. Over time, stonework and masonry can become damaged, decayed and weathered. Generally, Mother Nature is to blame but other causes can include; poor maintenance, bad repairs, neglect, bird/animal damage, graffiti and vandalism. Our experienced roofers and restoration craftsman have seen it all and know stone repairs better than most. Our service includes stonework repairs and cleaning, such as removing paint from stonework or other types of graffiti. At Balmore Specialist Contracts, we have years of experience in historic restoration treating, repairing and preserving all types of stonework in churches, cathedrals, historic buildings, town halls, civic relics and public and private property across Glasgow and Scotland. We understand the importance of careful stonework repair to our customers as many of these structures and monuments are of historical value and are more than just historic buildings. We are experts in this field and treat stonework with great care, attention and meticulous workmanship. This must be done to ensure any work undertaken doesn’t make the stone’s condition worse – as happens all too often with shoddy workmen. When faced with the need to have stonework repair or cleaning carried out, choose a reliable, experienced and qualified company when it comes to stone repairs and cleaning. Otherwise you risk your valuable stonework becoming more damaged by under qualified “cowboy builders” who cut corners and do not apply the correct techniques. Choose an expert in historic restoration stonework repair and cleaning – choose Balmore. Contact us for a free chat and some advice about your property and stonework repair or restoration.